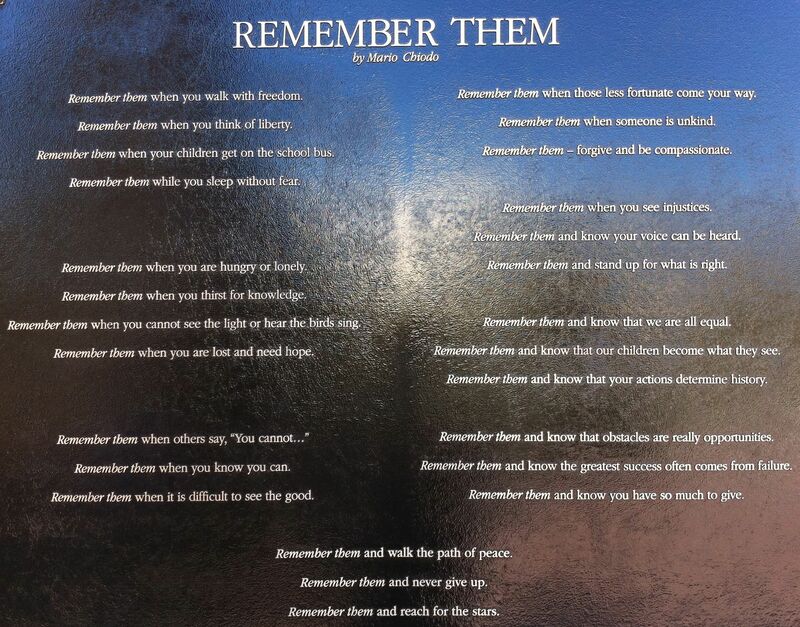 Yesterday was the unveiling of the first three sections of the “Remember Them” monument in Oakland. It was a spectacular occasion! Even though Karen and I had watched the actual installation (see my post on August 30), the monuments had been shrouded in tarps shortly after they were installed, awaiting the formal unveiling on September 6. There were hundreds of people present, with greetings and words of appreciation from Oakland dignitaries like our major Jean Quan, and Barbara Lee, our representative in Congress. In addition, of course Mario Chiodo the sculptor was there, as well as a number of others who made the monument possible either through their work on the project or their financial contributions. But most memorable to me were the children who sang, and several entire classes from local schools. I re-connected with my neighbors Barbara and Dorothy, and took loads of photos – as much as I could from my spot behind the media platform and several very tall guys! I have added several of the photos I took to my “Remember Them” photo album. At the moment of the unveiling family members of many of the people represented came to the foot of the monument to see up close the unveiling of those who they represented. Ruby Bridges, who also spoke during the ceremony, was the only living person on the monument present at the ceremony – she is the 6-year-old child who stands next to the head of Maya Angelou, now with a legacy of her own reaching out to school children across the country to help them understand the importance of human rights for all. Maya Angelou had been scheduled to be there, but was unable to do so. Her son, who is an Oakland resident, read a message that she prepared for the occasion. One day soon I plan to take my two granddaughters to visit the monument – knowing that what they see in the monument may not be the exact message they take away as a result of that first visit. But I know that what I saw in the rare moments that I spent with my grandparents as a child remains with me still, so I am reminded as I reflect on Mario’s poem that what my granddaughters see in the moments I spend with them, regardless of what we are doing together, will remain. It had better be good!! This entry was posted in Art, Making change, Oakland and tagged Mario Chiodo, Maya Angelou, Oakland, Remember Them, Ruby Bridges. Bookmark the permalink. Thank you so much for sharing your thoughts, Steve! What a wonderful message, and one that is particularly poignant this weekend. For me too (in more ways that you can imagine) today. Thank you for posting this wonderful poem. It has already been an inspiration!